The 2 Series Gran Tourer offers seven seats, front-wheel drive and a slinky silhouette. Jonathan Crouch reckons it's set for success. BMW's first seven-seat MPV looks a very classy entrance into a market where there are some seasoned campaigners. Don't expect the mainstream marques to roll over and let the 2 Series Gran Tourer scalp a bunch of conquest sales though. This fight could get dirty. Gran Tourer? Are we sure about that name? It sounds a bit like something you'd see on the back of a SAGA Holidays coach on a tulip fields excursion. Fortunately for BMW, the 2 Series Gran Tourer looks a good deal slinkier than anything favoured by the blue-rinse brigade. Quite a few commentators scoffed when the front-wheel drive 2 Series Active Tourer appeared. This is the seven-seat version of that car and, far from merely adding bulk and bloat to the design, the longer wheelbase car looks a good deal more elegant. We suspect there's going to be little in the way of grousing about this addition to Munich's portfolio. That said, this is a new market sector for BMW; one where it can't fall back on years of know-how. Peugeot, Renault, Toyota, Vauxhall and Ford all know this segment inside out. As a result, BMW's got to get this right first time in order to justify its price premium. It probably won't come as any great surprise that the 2 Series Gran Tourer launches with much the same set of engines that the 2 Series Active Tourer uses. They're all cleverly spun off the same modular base, the opener being the 136PS 1.5-litre three-cylinder 218i, which will scuttle to 62mph in 9.8 seconds. Graduate to the 2.0-litre four-cylinder turbo engine in the 220i and you're looking at 192PS, which translates to 62mph disappearing in less than eight seconds. There's a trio of diesels, starting with the 116PS 216d, while the 150PS 218d might well prove to be best seller. At the top of the range is the 220d xDrive version, sending its 190PS to all four wheels. Because of that all-wheel drive grip - not to mention the small matter of 400Nm of torque - it's just as quick to 62mph as the 220i. Power is sent to the front wheels via a six-speed manual gearbox; as an option, BMW offers a six-speed Steptronic transmission for the three-cylinder engines, while the four-cylinders motors can be coupled with an eight-speed Steptronic transmission (standard in the BMW 220d xDrive Gran Tourer). The 10-millimetre-lower M Sport suspension is standard on the M Sport trim and also available as a separate option. As an alternative, drivers can choose a chassis with Dynamic Damper Control: using the Driving Experience Control switch, two different damping settings are available. 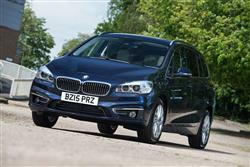 The longer wheelbase of the 2 Series Gran Tourer affords a little more elegance of line to its profile. All in, it's 214mm longer than the five-seat car and actually sits 53mm higher. The longer wheelbase of 2,780mm provides a decent slug of interior space and the elevated roofline affords respectable headroom in the back as well as making the car easier to get in and out of. Three child seats can be mounted in the second row, and a further two can be fitted in the third row. The second row seat slides fore and aft by 130mm, depending on whether you're prioritising legroom or luggage space. The backrest also reclines a few degrees. If maximum stowage space is required, the 40:20:40-split rear seat backrest can be remotely unlocked by pressing a button in the boot, then folded down to create an almost level cargo floor. The front passenger backrest can also be lowered to allow long objects up to 2.6m in length to be transported. The tailgate can be opened and closed automatically by push button operation or, optionally, via one of those sensors that has you hopping about waving your foot under the bumper. Prices aren't too ambitious, typically being about £2,000-£3,000 above those of an equivalent Vauxhall Zafira Tourer. This means that the range opens at just under £25,000 for the 218i. The range opens in SE trim, which includes Bluetooth, the iDrive operating system with Controller on the centre console, Intelligent Emergency Call, a 6.5-inch colour display and the Driving Experience Control switch with ECO PRO mode. In addition, every BMW 2 Series Gran Tourer also comes with a rain sensor with automatic headlight activation, as well as the 'Collision Warning with City Braking' function. Two-zone automatic air conditioning, rear Park Distance Control, front fog lamps and a multi-function steering wheel are also standard fit items. From 'SE', you can step up to 'Sport', which brings 17-inch alloys, sports seats and bodywork detailing in high-gloss black. The 'Luxury' model includes chrome trim, interior wood trim insets and leather upholstery, while the 'M Sport' model gets body styling, high gloss Shadow Line trim, sports seats in leather, an M leather multifunction steering wheel and 18-inch M alloy rims. Let's talk about the 218d Gran Tourer for a moment, because this looks to be the sweet spot in the model range when price, performance and economy are taken into account. Here, you get a seven seater that'll dip under ten seconds to 62mph quite comfortably, yet will return 64.2mpg on the combined cycle. True, it probably won't approach that number when you're seven-up, but the CO2 emissions of 115g/km will engender a rosy glow when you come to tax the thing. The usual suite of BMW EfficientDynamics energy-saving features is responsible for making those vaguely implausible looking figures, including Auto Start Stop and ECO PRO. When in ECO PRO mode, the throttle response is adjusted to encourage a more economical driving style. The extra economy created in ECO PRO mode is fed back to the driver, with the in-car displays showing the additional number of miles achieved. Can we forget all the brouhaha about a front-wheel drive BMW? We know that Munich has been producing them by stealth for years just with a MINI badge on the nose, so it's time to move on. The 2 Series Gran Tourer is certainly an interesting entrant into a market where mainstream manufacturers have been able to make hay without the threat of premium badges stealing their market share. Until now, that is. From a packaging perspective, the 2 Series Gran Tourer doesn't bring anything new to the party. Perhaps BMW are just playing to their traditional strengths at the moment and learning the rules of this game as they go along. So if you want the slickest and most practical seating system and the most ingenious use of space in its class, you're not looking at it here. What you do get is a vehicle with incredible engines and more BMW in its DNA than you might expect. It'll be a tough one to resist for most MPV buyers.